I’ve spoken to a lot of businesses about Social Media over the years and as soon as I mention Twitter the usual remarks I get is “I don’t know where to start!” or “I don’t know who I should be following”. This got me thinking of how I could help Small Businesses in Geelong and Melbourne (and around the World) get more out of their Twitter accounts! The Bootcamp came alive! 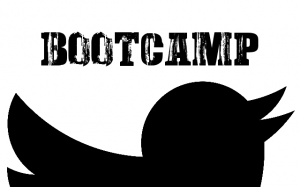 Before I get into the 30-Day Twitter Bootcamp schedule here are a few things you will need to make sure you are ready to go, like a real Bootcamp, you need to make sure you have a base level of Twitter “fitness” before you start doing Twitter “burpees”…. everyone hates burpees! #1. Make sure your Twitter profile is up-to-date. This is your bio, profile photo and header image. This is what people see when you interact with them on Twitter and there’s no room for eggs in this bootcamp! #2. Follow People in your area, not sure how to get started? To make this easier I have created two lists for Geelong and Melbourne tweeps, these are a work in progress but are a great place to start. #3. Create a list of all the potential clients you want to focus on; this will come in handy to reduce all the Twitter noise you are about to experience! #4. Get your head around #Hashtags, you need to know when to use them and when not to use them. See 5 Ways Your Business Should Use Twitter Hashtags on Mashable for more details or Google “how to use hashtags” for more details. Ok you’re now set to get Twitter fit! The basic idea of this Bootcamp is to repeat the following 4 training schedules everyday for 30 days! Stick to it and you will start to see a vast improvement with your Twitter interactions and followers. Every Morning: 10 minutes while eating your breakfast. Check your RSS reader for any new news articles or blogs worth sharing, share these but not more the 2-3! Use appropriate #hashtags in your tweet! Go through your followers or my Geelong and Melbourne tweeps lists and interact with 2 or 3 people, make sure it’s about something you are familiar with and DO NOT offer them a service or product! If you get a response, respond back! Favourite and Re-tweet at least 2+ tweets that you like, this isn’t as good as interacting with someone but you’ve got their attention! Lunch: 10 minutes while you’re eating your Noodle Box. Check for any responses from the morning and reply to them all. Check your RSS reader for any new news articles or blogs worth sharing; share these but not more the 1-2! Go through your followers and interact with 2 or 3 people and if you get a response, respond back! Favourite and Re-tweet at least 2+ tweets that you like. Where are you having lunch? Do they have a Twitter account? If they do, then tweet them and let them know you’re there! Worth thinking about this for breakfast and dinner too. Evening: 10 minutes during the nightly news! Check for any responses from lunchtime and reply to them all. Check your RSS reader for any new news articles or blogs worth sharing; share these but not more than 1-2! Go through your followers and interact with 2 or 3 people and if you get a response, respond back! Offer your help or gudance but DO NOT go the sales pitch! After Dinner: 5 minutes while you’re relaxing on your couch watching TV. Check for any responses from this evening and reply to them all. Go through your followers and interact with 2 or 3 people and if you get a response, respond back! Again, offer your help or gudance but DO NOT go the sales pitch! It may sound like a lot of work but once you get used to sharing news articles and blogs, while interacting with local tweeps you’ll be able to fit this into your day quite easily. Good luck and if you need any help with implementing this or would prefer we did it for you, then don’t hesitate to contact us! Till next time, stay social.